Can machines be art? 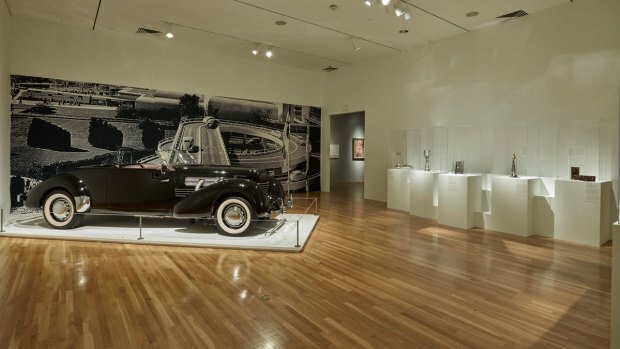 Cult of the Machine: Precisionism and American Art, on display at the Dallas Museum of Art through January 6, explores the fascination and anxiety induced by the man-made creations of America’s early 20th century Machine Age. 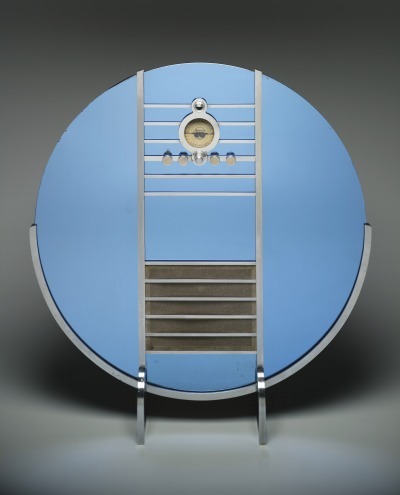 A radio displayed in the exhibition was a sleek addition to any home. The ultimate American machine, a 1937 Cord 812 Supercharged “Sportsman” Cabriolet Coupe, is a showstopping expression of mechanical art. The ultimate American machine, a 1937 Cord 812 Supercharged “Sportsman” Cabriolet Coupe, is a showstopping expression of mechanical art. “It’s known for its dramatic style,” Mike Ames, a local classic car collector, said. “Look at the complexity of the shapes and those were stamped out in very low volume.” Of the 64 built, only 12 of these cars still exist. With its supercharged V8 engine, ability to go up to 120 mph, concealed gas cap, inset headlights, suicide doors, and coffin-shaped nose, this car was a sensation. It cost $3000, or about $52,000 in today’s economy. Ames still drives the car regularly, despite its lack of turn signals. The car’s drivability is exceeded only by its beauty. The celebration of technology continues with Charles Sheeler’s portraits of mechanical elements, commissioned by Fortune magazine and published in 1940. “Sheeler traveled across the country, taking pictures of what he termed ‘the nation’s instruments of power’,” Canterbury said, pointing out his focus on an airplane’s propeller and a locomotive’s gears. But one of Sheeler’s works, Suspended Power, reveals a disturbing aspect of the Machine Age. The painting depicts a massive turbine being lowered, dwarfing a human worker. Sheeler rarely included humans in his work and when he did, it was to demonstrate scale. “We’re left with this kind of unsettling sense of disquiet that these workers could be completely crushed by this machine,” Acker said. Charles Sheeler, Suspended Power, 1939, oil on canvas, Dallas Museum of Art. A film clip of Charlie Chaplin’s Modern Times echoes this anxiety. Chaplin works on an assembly line and becomes obsessed with keeping up with the machine. Soon he finds himself trapped in the gears. “That really speaks to the fear of some people that they could be dominated by these machines, that they could be slaves to the machines,” Canterbury said. Skyscrapers fascinated artists with their overwhelming verticality and their representation of the American ambition to live among the stars. In New York City, skyscrapers soared with the development of steel frame structures and high-speed elevators. “When you think about these buildings, they were really machines turned on end,” Canterbury said. “It’s an island of vertical machines.” While artists portrayed the buildings’ majestic beauty, many works explore the looming alienation and loneliness of urban life. The exhibition ends with a surprise: paintings depicting farms. During the Machine Age, nostalgia for rural life and a renewed interest all things Colonial and Shaker developed. “These artists were reminded that they were tapping into something that was part of their ancestry,” Canterbury said. Artists applied Precisionism techniques, painting rural scenes bathed in the glow of a harsh, modern light. Even in the most rustic settings, modern life invades with its own brand of beauty.